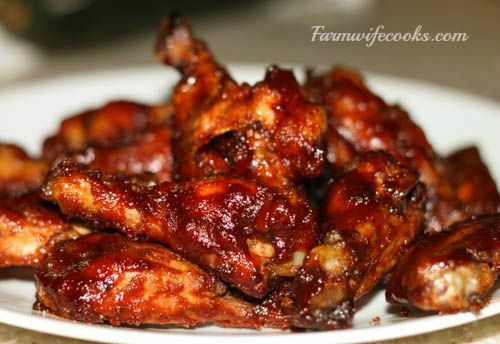 Are you looking for a wing recipe that will win the crowd over on game day? These slow cooker Sticky Chicken Wings will kick up any party! Cookbook! Cooking these wings in the crock pot helps the chicken soak up the flavor where as other recipes I had tried the flavor was only in the sauce. The other thing I like about this recipe is the chicken is so tender it will all but fall off the bone. This recipe stars by mixing together part of the brown sugar and soy sauce, garlic, ginger (if you don’t have fresh you can use ground, about 1/2 teaspoon should work) and cayenne pepper. The cayenne pepper controls the amount of heat in this recipe so you as much or as little depending on your taste. I am a wimp in the spicy food department but my hubby likes the heat so I usually put 1/4 teaspoon in the slow cooker as the directions state but when I am basting the wings I leave the pepper out of half of the sauce. 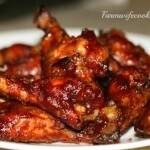 Place this sauce in the crock pot and add the chicken wings seasoned with salt and pepper. You don’t need to go as heavy on the salt because the soy sauce is also salty. Toss the wings in the sauce and let them cook for 4-5 hours. are a great tool in the kitchen and will help your meat come out perfect every time. Once the wings are done cooking in the slow cooker mix up the remaining brown sugar, soy sauce, water, cayenne pepper and tomato paste. Transfer the wings to a foil lined baking pan and brush the wings with the sauce. Pop the wings in the broiler for 5-10 minutes until crisp and then turn and coat with the remainder of the sauce and cook for another 5 minutes. The broiler will help crisp up the chicken wings which is the only downside to only cooking the wings in the crock pot. Combine 1/4 cup brown sugar, one Tablespoon soy sauce, garlic, ginger and 1/4 teaspoon cayenne pepper in a slow cooker. Season chicken wings with salt and pepper and add to a 6 quart slow cooker. Toss wings to coat well. Cover and cook on low for 4 to 5 hours, until chicken is tender and no longer pink in the center. Remove wings to a rack on aluminum foil-lined backing sheet; set aside. In a bowl, combine remaining brown sugar, soy sauce and cayenne pepper, water and tomato paste; mix well. Brush wings with half of the sauce. Broil wings until crisp on one side, about 5-10 minutes. 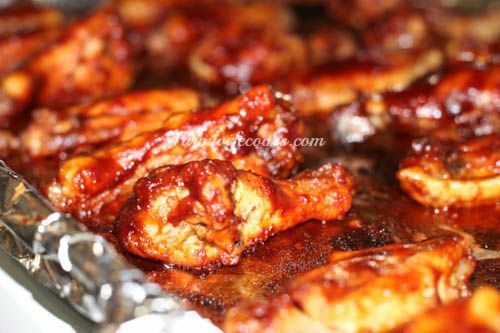 Turn wings and brush with remaining sauce; broil until other side is crisp, about 5 minutes.